Quince Conserve for sale. Buy online at Zingerman's Mail Order. Gourmet Gifts. Food Gifts. Quince is the main ingredient in Spain’s famous membrillo. The pear-like fruit is used to make a sweet paste, usually served along with manchego cheese. 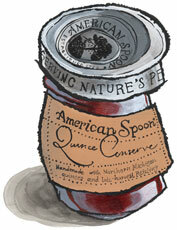 Luckily, quince can thrive in the unique climate of northern Michigan which just so happens to be the home of American Spoon, our longtime source for outstanding preserves, fruits, mustard and more. They take fresh quince from Northport, Michigan, puree it, and cook it down with a local Riesling to create their own spreadable version of membrillo. Slightly acidic, its flavor is bright and a little earthy with a velvet smooth texture. Do like the Spaniards and pair with a salty cheese or slather on your favorite bread to start your day.